Our report, Coordination in the Natural Resource Damage Assessment Process: Project Planning and Selection, describes some tools that are available to the Deepwater Horizon NRDA trustees during project planning and selection that could help coordinate their activities internally within the NRDA program and with external entities. In particular, it focuses on (1) project screening criteria; (2) strategic frameworks; and (3) joint restoration planning. 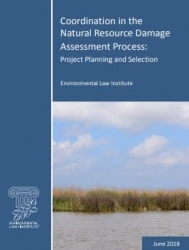 This new report builds on Coordination in the Natural Resource Damage Assessment Process: General Tools and Mechanisms (March 2018), which surveyed some of the general tools and mechanisms available to the trustees to help coordinate their activities.